"The Skinnytaste Cookbook" is a wonderful compilation of recipes by Gina Homolka, whom created and writes the skinnytaste blog. This book contains a great variety of recipes complete with pictures of the food. I am looking forward to trying many of these recipes as they are low on calories and use ingredients that are common and I typically have on hand already at home. Also, there is a variety of cooking styles, including skillet and using the slow cooker which I love as some days it is more convenient to throw things in my crock pot in the morning and let it cook all day. I highly recommend this cookbook for anyone whom enjoys this blog, whom is looking for lighter recipes that are full on flavor and easy to prepare. To learn more about this author, click here! 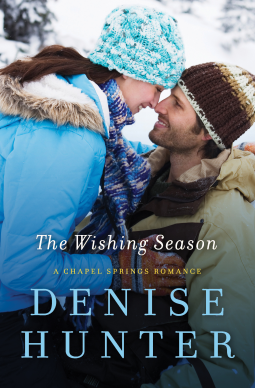 "The Wishing Season," part of Denise Hunter's Chapel Springs series, is a wonderful read that is not to be missed for those whom have become a fan of Denise's books and the McKinley family. First of all I love this cover, it is just so cute and so perfect for this time of year! :) Also, I have loved the previous two books in this series so I just had to read this book as soon as I was able to and I was not disappointed. PJ and Cole are both wonderful main characters; I loved them and their hearts and rooted for both of them pursuing their dreams right away from the start. Denise has such a talent for writing as she is able to bring the characters and the setting to life. Also, although the focus is on PJ, the rest of the family are all a part of the story and I love how it is so easy to get back into the storyline that is continued from the previous novels. I highly recommend this sweet love story and am looking forward to the next in the series coming out in June! I started paging through "Novel Interiors" as soon as I took it out of the box! What a gorgeous and inspiring book! Not only is this book filled with beautiful pictures, but it is filled with quotes that any book lover will enjoy. This has me thinking about different ways to decorate my house, but it has also had me starting a list of novels that I just have to read now as the pictures and quotes have me wanting to find out the whole story. I am a complete book lover and if you know a person who is and you still need to get him or her a Christmas present, do not hesitate a second in getting this for them! This is a wonderful book that I am going to spend hours and hours looking through and enjoying! "Swept Away" is the latest novel in the Quilts of Love series and it was a sweet story that I thoroughly enjoyed. Sara is trying to live her own life; however she is the only family left for her grandmother and feels responsible for her as well especially as Sara feels guilty over her parents' deaths. Andrew has been dealing with hurt and guilt in his life and has been off the radar; however he gets drawn back into society. Throughout the book both Andrew and Sara are trying to sort through things in their own lives and if there is anyway to move forward. This is a complex book as there is so much included in this book including details about hiking, quilting, ballads, in addition to family relationships and moving forward and forgiving one's self. "Swept Away" is one of my favorite books in this series so far; I highly recommend this. About the author: Best-selling novelist Robin Lee Hatcher is known for her heart-warming and emotionally charged stories of faith, courage, and love. The winner of the Christy Award for Excellence in Christian Fiction, the RITA Award for Best Inspirational Romance, two RT Career Achievement Awards, and the RWA Lifetime Achievement Award, Robin is the author of over sixty novels. Robin Lee Hatcher's latest novel is a sweet love story and "Love Without End" focuses on a character and place we met in her previous novel, "A Promise Kept." Chet is given a second chance for love and happiness in this novel and it is a beautiful story that focuses on family, second chances and love. Kimberly and Chet are such real-characters and they are so easy to relate to; I found myself empathizing with them throughout the book. Robin has a true talent for bringing real life situations and real life family to life in this book. The difficulties in life are not glossed over, but shared in a way that makes the reader know that she is not alone. This is a sweet romance that is so real and draws the reader immediately into the story.